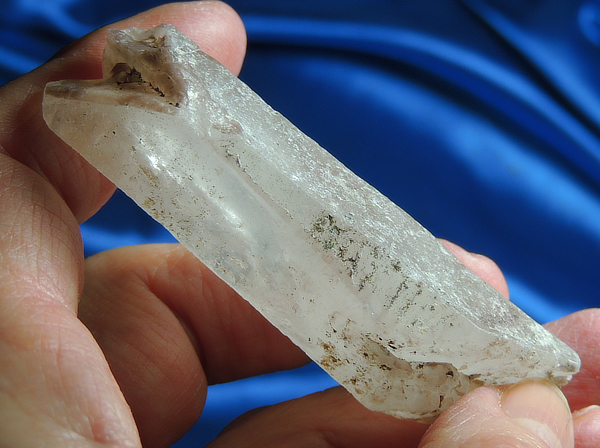 This is a rare and rather humble-looking 1.4 oz, 2.8” by 0.9” by 0.6” DT quartz from the Chilean side of Patagonia! His rugged-looking presentation is because of small deposits of calcite on his sides but you can easily see the luster under them. Two sides are smooth and Lemurian-lined while the rest are etched and both terminations have mauve hematite coloration in them. His lower termination is slanted with two stargazer students on it while his upper is twined into a “V”. He may be humble and rugged-looking like the fabulous area that birthed him … and yet, he is splendid in his expression. He is a true emissary of Patagonia! This crystal has a very sacred feel to him. Tibet has long been regarded as one of the most Spiritual place on earth. And it is where Jesus is fabled to have passed his youth, learning and developing his skills until time to return to his life's role. And it is said that his Spirit returns here often along with many of the Ascended Masters. Crystals such as this were used frequently to assist with the focus of Spiritual intent. Hold him comfortably and immediately, you will notice an absolutely huge pull at the Third Eye. If you now place a side ng against the Third Eye, you will feel an immense movement through the Crown and into the Ethereal Chakras. It's as if you were wearing a giant torch on your head. This Spirit is for one opening to Light Work and with a need for protection from psychic attack. He enables you to fully charge your aura into a blaze of energy. Simply amazing!